Objective Social comparisons (ie, self-evaluation in comparison with others) influence patients’ perspectives of their disease and may impact motivation and health behavior; however, little is known about patients’ perspectives toward receiving such information in a clinical context (eg, from their doctor’s office or health system). This study aims to understand patients’ perspectives and anticipated responses to receiving social comparison information regarding measures of their diabetes-related health status (eg, A1C) and how receiving such information would compare with goal-based comparisons (ie, self-evaluation in comparison with goal). Research design and methods We conducted semistructured interviews with 25 patients with type 2 diabetes mellitus (T2DM) regarding social and goal-based comparisons involving their diabetes health status and qualitatively analyzed interviews for themes. Results We identified seven major themes: self-relevance, motivation, self-concept, emotions, information seeking, medical care, and self-care. Participants commonly anticipated increased motivation and improved health behaviors in response to both social and goal-based comparisons. Subthemes unique to social comparisons included belief that this information would be motivating by engaging some patients’ competitiveness, perception that this information was more ‘personalized’ than comparisons with a standard goal (eg, A1C<7), and desire to learn from individuals similar to oneself who were doing better. Conclusions Our findings provide significant insights into the anticipated response of patients with T2DM to receiving social and goal-based comparison information regarding their diabetes health status. Providing patients with diabetes with social and goal-based comparison information may affect motivation, mood, and self-concept in ways that may improve or sustain diabetes self-care behaviors for some patients. A growing literature demonstrates the important role of social comparisons (ie, self-evaluation in comparison with others) on patients’ perspectives of their disease and shaping motivation and behavior, but patients’ perspectives toward receiving such information in a clinical context (eg, from their doctor’s office or health system) are unknown. We found that social comparison information may be viewed as more personalized, uniquely engage some patients’ competitiveness, and promote information seeking when compared with goal-based comparisons (ie, self-evaluation in comparison with goal status) and that providing patients with diabetes with social comparison information regarding measures of their diabetes health status (eg, A1C) may affect motivation, mood, and self-concept in ways that may improve or sustain diabetes self-care behaviors for some patients. Our findings suggest that further research is needed to determine how to best share social comparison information with patients, which patients are most likely to benefit, and whether patients’ anticipated responses match actual responses to this information as well as the impact of sharing this information on cognitive, behavioral, and clinical outcomes. Despite the potential of social comparisons to positively influence diabetes self-care behaviors and compliment goal-based comparisons, little is known about patients’ perspectives toward receiving such information in a clinic context (ie, from their doctor’s office or healthcare system). This study aims to understand patients’ perspectives and anticipated responses to receiving social comparison information regarding measures of their diabetes-related health status (eg, A1C, cholesterol and eye examination in the last year) and how receiving such information would compare to goal-based comparisons. From November 2015 to February 2016, we conducted individual qualitative semistructured interviews of patients with type 2 diabetes mellitus (T2DM). Qualitative interviews are the preferred methodology to gain in-depth understanding of individual perspectives or responses to specific topics or stimuli.19 Study participants were recruited from the Vanderbilt Adult Primary Care (VAPC) clinic at Vanderbilt University Medical Center (VUMC) in Nashville, Tennessee. The VAPC clinic cares for about 25 000 unique patients annually of which about 4500 (18%) have diabetes. The clinic is composed of 36 part-time and full-time attending physicians and 31 nurses and medical assistants. All clinical data are entered into an electronic medical record, and patients are provided access to a portion of their clinical data through a patient web portal. The clinic’s patient population is 60% Caucasian (non-Hispanic), 30% African-American, 8% Hispanic, and 2% Asian and closely matches the racial demographics of the Nashville population.20 The majority of clinic patients (74%) are privately insured, 24% are on Medicare/Medicaid, and less than 2% are uninsured. Eligible patients were identified automatically using VUMC’s Subject Locator to query the electronic health records (including diagnosis codes) associated with patients with upcoming clinic appointments for discrete inclusion and exclusion criteria. English-speaking patients aged 21 years and older with T2DM (identified by International Statistical Classification of Diseases, Ninth/Tenth Revision codes) and prescribed at least one antihyperglycemic medication were eligible to participate. Since a patient’s health system or doctor’s office is uniquely well positioned to provide patients with social comparison information (eg, patient’s A1C in comparison with the average A1C of other patients who are characteristically similar), we focused our study on receiving such information in that setting and limited recruitment to patients with an established relationship with a primary care physician within the clinic (at least two visits within the preceding 24 months). Patients with cognitive impairments and nursing home residents were excluded. All eligible patients with upcoming clinic appointments were mailed a letter describing the study and asked to contact a research coordinator if they were interested in participating. Letters were sent to 841 patients with upcoming appointments on a rolling basis over 4 months. Interested patients (n=68) contacted the research coordinator who explained the study, answered questions, and confirmed eligibility. Thirty-five patients wished to participate and were offered the opportunity to schedule a study interview on predetermined dates based on interviewer availability. Whenever possible, patients were offered an interview on the day of their upcoming clinic appointment. Patients who were unavailable on the predetermined interview dates were contacted on a rolling basis as additional interview dates became available until thematic saturation was reached. We aimed to enroll a mix of patients who reflected a broad range of experiences with diabetes including patients who use and do not use insulin, with currently well controlled and poorly controlled diabetes, and with and without diabetes-related comorbidities. This occurred naturally as study recruitment progressed, thus purposive sampling was not required. All participants provided written informed consent. Patients received $30 as compensation for their participation. Enrolled patients were asked to complete a short, self-administered questionnaire prior to their interview. The questionnaire included basic demographic questions along with the following measures: three-item health literacy screen21; five-item diabetes numeracy scale22; and the Perceived Diabetes Self-Management Scale.23 In addition, clinical data including the most recent hemoglobin A1C, medication list, and problem list were extracted from participant’s medical record. Audio files of interviews were transcribed by a professional transcription service (http://www.rev.com/transcription). Transcripts were checked for accuracy and identifying information was removed. A coding scheme was developed by two of the authors (DGS and KRB), who did not participate in the interviews, using a combined approach that used a priori and inductive processes and consistent with methods described in Miles et al’s study.26 A ‘start list’ of codes grouped into broad categories was developed based on the interview guide and research aims. The first five transcripts were then open coded, and initial themes ‘grounded’ in the transcripts were identified and used to refine the start list into a preliminary codebook that provided clear operational definitions for each code.27 This initial set of codes was tested on each subsequent interview transcript; codes were further revised in an iterative manner using the constant comparison method between and within transcripts, and additional ‘grounded’ axial codes were applied.27 The final coding scheme was established, and two coders coded all interview transcripts. The coders applied codes to participants’ statements (primary unit of analysis) and were permitted to apply multiple codes to a single statement as applicable. Once the coding was completed, the codes were organized into the main themes. Representative excerpts were selected from interview transcripts and edited slightly for grammar and spelling. We used NVivo 10 (QSR International, Burlington, Vermont) to assist with qualitative analysis. Based on a review of the literature,13–16 28–33 we developed an a priori conceptual model consisting of four domains: (1) type of comparison; (2) cognitive effects; (3) behavioral effects; and (4) effect modifiers to organize our analysis. Qualitative analysis of interview transcripts identified relevant themes and subthemes within each of the four general domains, which were subsequently added to the final model (figure 1). Final conceptual model of social and goal-based comparisons of diabetes health status. *A priori domains used to organize analysis. †Relevant themes and subthemes identified from qualitative analysis of interview transcripts and subsequently added to the model. Descriptive statistics were used to characterize the study participants. Statistical analyses were performed using SAS V.9.4. We interviewed a total of 25 patients, at which time we had reached saturation. Table 1 shows the characteristics of study participants. Participants had a mean age of 65 years (range 45–81), 52% were women, 68% were white, the mean A1C was 7.5 (range 5.6–12.6), 44% had an A1C above 7 (range 7.1–12.6), and 52% were currently being treated with insulin. Participants with a college degree or higher made up 52% of our sample. Many participants had comorbid conditions: 71% had hyperlipidemia, 60% had hypertension, and 20% had atherosclerotic cardiovascular disease. We identified seven major themes: self-relevance, motivation, self-concept, emotions, information seeking, medical care, and self-care. 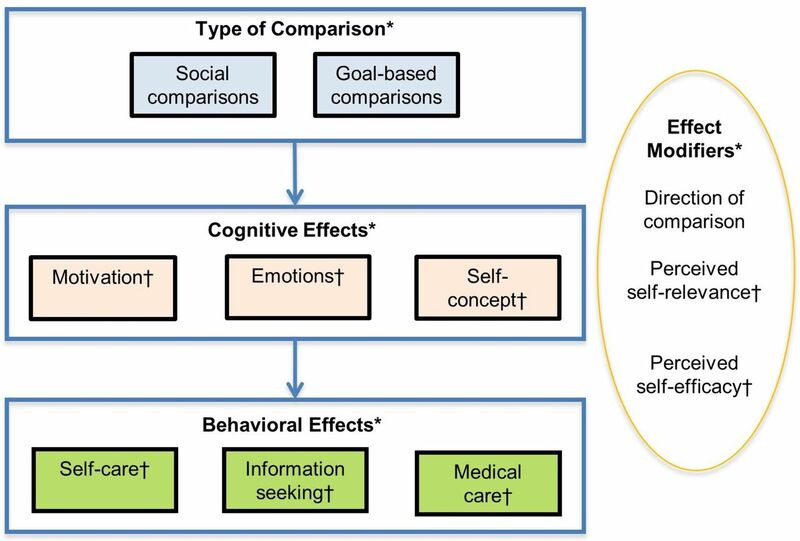 Motivation, self-concept, and emotions represent potential cognitive effects of comparison information; information seeking, medical care and self-care represent potential downstream behavioral effects; and self-relevance represents a potential effect modifier (see conceptual model, figure 1). Table 2 lists the major themes and their associated subthemes including those that were unique to participants’ statements regarding social comparisons. Each of the major themes is presented below along with illustrative quotes. Most participants (n=14) described goal-based comparisons of their diabetes health status as important to their understanding of their diabetes management (subtheme). It’s my fault [my blood sugar is higher than goal]. [I] should have been back on a diet. I should have stayed out of that pie. Only two participants expressed disinterest and described relying primarily on a subjective sense of well-being. I know I can look up recommendations or whatever, but if I’m doing good I don’t need to know that. I mean, I’m satisfied. Even more participants (n=17) expressed a desire for social comparison information regarding their diabetes health status. I can see how that could be very helpful […] it would be interesting to see how other diabetics fall, […] it might also make me a little more appreciative if I’m doing a lot better. Only four patients described disinterest in social comparison information and often described their lack of interest in terms of the uniqueness of each person’s experience (subtheme). I’m not curious about how other people are because I think any disease or any illness affects everybody differently in one form or another. Thirteen participants anticipated that being compared with others who shared certain characteristics would make the information more relevant to them. Participants specifically commented on the importance of being compared with others who shared similar characteristics including one or more of the following: same age group, gender, body type, medications, and racial and ethnic group. I would think that it would be more important that it be women because everybody is different and men’s bodies are totally different from women’s bodies and they’re going to react in a certain way that a woman would not, so I would rather compare myself to a group of women that are in the same category, say the same age. Some participants who described a desired for social comparison information commented on the more personalized nature of the information (subtheme) and opportunity to assess their condition relative to similarly matched others (subtheme). I would be happy to have that information. To see how my situation compares to other people. Maybe if there was some things in there about what they’re doing that’s different from what I’m doing, because that might be able to give me suggestions. If somebody with my problems and those kinds of things, […] what they’re able to do to correct that. Nearly all participants anticipated enhanced motivation (subtheme) by either upward goal-based comparisons (eg, information that a measure of their diabetes health status was not at goal) or upward social comparisons (eg, information that other patients like them were on average doing better). [If my blood sugar was higher than others like me,] it would definitely motivate me to do better. Some participants anticipated their motivation would vary depending on the specific measure of health status (eg, A1C, blood pressure and diabetic eye exam in the last year) involved in the comparison. Distinctly, three participants framed their anticipated motivation from upward social comparison information in terms of competitiveness (subtheme). [I]t would encourage me to try to do better. Like I said, we all have competitiveness in us and to see that everybody else is winning the race and you’re in last place. Two participants anticipated feeling a sense of resignation (subtheme) at finding out their hemoglobin A1C was not at goal (upward comparison). I think the only thing I have to fight is resignation to the situation. Why not take another cookie? Two participants anticipated social and goal-based comparisons would have no impact on their motivation (subtheme) and framed their lack of motivation in terms of their perceived self-efficacy (subtheme). I’m not able to do anything really active to counteract it. I take it like it’s a fact of life type of thing. Six participants anticipated sustained motivation (subtheme) that was unique to downward social comparisons as opposed to goal-based comparisons. [I]f mine’s better, I’d want to keep on making sure it stays better. Nearly half of the participants (n=12) anticipated engaging in self-evaluation (subtheme) in response to both upward social and goal-based comparison information related to lifestyle-sensitive measures of diabetes health status (eg, hemoglobin A1C and cholesterol). I’d be thinking […] what kind of food changes I need to make. Yeah, if my numbers were not as good or better than anybody […] that would motivate me to seek out what I needed to do next. A few participants (n=5) anticipated their self-evaluation in response to upward social and goal-based comparisons would negatively affect their self-concept or beliefs one holds about oneself (subtheme). I would feel somewhat disappointed in myself that I am not doing the things that I am supposed to be doing. Two participants anticipated that downward comparisons would positively affect their self-concept (subtheme). That would make [me] feel good […] like a winner, accomplished. Participants anticipated both positive and negative emotional reactions to social and goal-based comparisons of measures of their diabetes health status depending on the direction of the comparison, the type of measure, and their medical history. Emotional responses were anticipated almost exclusively to comparisons regarding the lifestyle-sensitive measures of diabetes health status compared with preventative care measures (eg, diabetic eye exam within the last 12 months). Eighteen participants anticipated negative emotional responses (subtheme) to upward social and goal-based comparisons related to lifestyle-sensitive measures. When I have to see that red number it makes me sad. Especially if it’s a big change. Eleven participants also anticipated positive emotional responses (subtheme) to downward social and goal-based comparisons related to lifestyle-sensitive measures. That’d make you feel good about yourself and happy, like you’re a winner. Some participants explained their anticipated emotional response to upward comparisons of specific lifestyle-sensitive measures of diabetes health status (eg, blood pressure) in terms of the perceived self-relevance of the measure. For example, one participant whose mother had hypertension and had suffered a myocardial infarction described how an upward comparison of her blood pressure would be particularly emotionally resonant. [S]he was about 72, had the widow-maker heart attack, and her blood pressure was through the roof. […] Yeah, with what went on [with her], I won’t say it would freak me out, but it would grab my attention. Slightly more than half of the participants (n=13) anticipated seeking information about self-care (subtheme) and medication options (subtheme) in response to both upward social and goal-based comparisons. I would be talking to my doctor. I’d be thinking about what kind of drug changes I need to make. What kind of food changes I need to make. Yeah, if my numbers were not as good as anybody in the room that would motivate me to seek out what I needed to do next. In response to both upward social and goal-based comparisons, some participants also anticipated seeking information from a healthcare professional such as their primary care physician (subtheme) while others anticipated looking online (subtheme). I would need to look online and see what I can do to reduce [my blood sugar]. If I were higher than average in my group, then I would probably want to talk again to Dr. ____ about what do I need to do. In response to upward social comparisons, some participants anticipated a desire to learn from individuals similar to them who were doing better (subtheme). I would want to know how these people are maintaining. If [they are] lower than X, what are the things that they are doing to get to that? Eighteen participants anticipated seeking medical care in response to both social and goal-based comparisons including scheduling an appointment or referral (subtheme) or medical services such vaccinations (subtheme). I would probably set an appointment sooner than the regular period. In contrast to upward comparisons for lifestyle-sensitive measures of diabetes health status, some participants anticipated that upward comparisons for diabetes preventative services would be more straightforward to address (subtheme). I’d go get the [vaccination]. That’s the simplest thing. Finally, 10 participants anticipated enhanced self-care (subtheme) in response to upward social and goal-based comparisons including improving their diet, exercise, and adherence to medications. I would definitely modify my diet and probably pick up my exercise a little bit. One participant anticipated diminished self-care (subtheme) in response to upward comparisons of lifestyle sensitive measures of diabetes health status. I’d probably say, ‘The hell with it. I might as well eat what I want.’ That’s what I would think. Our findings provide significant insights into the anticipated cognitive and behavioral responses of patients with T2DM to receiving social and goal-based comparison information regarding their diabetes health status. Prior studies have focused on understanding the social comparisons patients make on their own and the impact of forced comparisons with a specific target, typically a hypothetical patient, on affect, motivation, and self-care.13 15 16 32–34 Our study is unique in examining patients’ desire and anticipated response to receiving social comparison information in a clinical context involving actual patients and how receiving such information would compare to typical goal-based comparisons. Many patients desired social comparison information and may perceive it as more personalized than goal-based comparisons. Our findings suggest that the perception of similarity (ie, how much the individual identifies with the target) may drive both the perceived self-relevance of the information and its perception as more personalized. Researchers have noted that perceived similarity with the comparison target may decrease psychological distance between the self and the target thereby increasing self-relevance and the ability of the comparison to impact behavioral intention.14 35 In particular, participants noted the importance of being compared with others within their same age group, gender, racial and ethnic group, on similar medications, and with similar body types. In their study of patients with T2DM who read one of four brief descriptions of a patient with T2DM, Arigo and colleagues34 also noted that the perception of similarity strongly mediated the impact of the comparison on motivation for diabetes self-care behaviors. Patients in our study anticipated increased motivation from both upward social and goal-based comparisons, and noted that social comparisons, in particular, may be motivating by engaging patients’ competitiveness. While other researchers have found that downward comparisons can result in decreased motivation,34 the patients in our study often anticipated downward comparison information would sustain their motivation for self-care. Patients who anticipated not being motivated by upward comparisons either described social comparison information as irrelevant to their unique experience of diabetes or described feeling resigned to their current diabetes health status and a lack of confidence in their ability to effect change (ie, low self-efficacy). Our findings highlight the potential modifying effects that the direction of the comparison, perceived self-relevance, and perceived self-efficacy (see conceptual model, figure 1) may have on patients’ motivation in response to comparison information. Our findings extend those of Schokker and colleagues15 who found that patients highly focused on obtaining positive outcomes (high promotion-focused), as opposed to those focused on preventing a bad outcome (high prevention-focused), reported more motivation when confronted with an upward comparison with another patient with diabetes. Our findings suggest that providing patients with diabetes with social and goal-based comparison information regarding a variety of measures of their diabetes health status may affect motivation, mood, and self-concept in ways that may improve or sustain diabetes self-care behaviors for some patients. Social comparison information in particular may be viewed as more personalized, uniquely engage some patients’ competitiveness, and drive more information seeking. Several interventions have sought to increase patients’ motivation and confidence to manage their diabetes41 42; however, progress has been limited, and the need for effective, scalable and sustainable interventions persists.41 43 Strategies such as the ‘know your numbers’ campaign (promoting patient knowledge of their actual and target health outcomes such as HgbA1C values) have had mixed success in increasing the confidence and motivation necessary to improve patients’ diabetes self-management.10–12 44 To be effective, strategies to provide information to patients must be combined with other behavioral strategies to motivate and assist patients in managing their diabetes.10 12 43 45 46 The recent push toward electronic health record adoption and the development of patient web portals provide a new opportunity for healthcare systems and patients to view, share, and take action in response to health data and information. How to optimally use these new technologies to improve patient care remains an active area of research.47 Despite evidence that social comparison information may increase motivation and is central to the patient experience,15 28–30 32 it has been underused to modify health behaviors in patients with diabetes or other chronic medical conditions. Healthcare systems may consider leveraging patient-facing technologies such as patient web portals to provide patients with social and goal-based comparisons of their diabetes health status alongside other features aimed at increasing patient engagement and facilitating information seeking and self-care (eg, educational modules, secure messaging and text reminders).47–50 Further research is needed to determine how to best share social and goal-based comparisons with patients, which patients are most likely to benefit, and whether patients’ anticipated responses match actual responses to this information in practice as well as the impact of sharing this information on cognitive, behavioral, and clinical outcomes. Our study has some limitations. Participants were limited to a convenience sample drawn from a single academic primary care clinic, thus our findings may not be generalizable to other settings. Although our sample was heterogeneous across a number of different sociodemographic and clinical variables, it was not fully representative the overall population of patients with T2DM in the USA. In addition, our sample size was not large enough to assess differences based on sociodemographic factors such as race/ethnicity, education, and income. Participants electing to participate in research may be inherently more motivated, which could result in selection bias. Participants answered questions in the setting of one-on-one in-person interviews, and social desirability bias may have impacted our results. Moreover, participants were asked how they would respond to hypothetical scenarios, and their actual response may vary from their anticipated response. Despite these limitations, our study highlights a potentially significant strategy for increasing patient motivation and improving diabetes care. Providing patients with social and goal-based comparison information regarding their diabetes health status has the potential to be an effective and scalable approach to promoting diabetes self-care behaviors. Further research is needed to determine how to deliver this information reliably to patients and its impact on diabetes care. We wish to thank Tiffany L Israel, MSSW, Community Navigator, at Vanderbilt Institute for Medicine and Public Health for her help interviewing participants for this study. Centers for Disease Control Prevention. National diabetes statistics report: estimates of diabetes and its burden in the United States 2017. Atlanta, GA: US Department of Health and Human Services, 2017.
. Diabetes self-management education and support in type 2 diabetes: a joint position statement of the American Diabetes Association, the American Association of Diabetes Educators, and the Academy of Nutrition and Dietetics. The Diabetes Educator 2017;43:40–53.
. Health, coping, and well-being: perspectives from social comparison theory: Psychology Press, 2013.
. Understanding performance appraisal: social, organizational, and goal-based perspectives: Sage, 1995.
; Qualitative research practice: a guide for social science students and researchers: Sage, 2013. United States Census Bureau . QuickFacts. Davidson County, Tennessee, 2016. https://www.census.gov/quickfacts/fact/table/davidsoncountytennessee/PST045216. (accessed 1 Feb 2018).
. Qualitative data analysis. Sage 2013.
. Handbook of social comparison: theory and research: Kluwer Academic Publishers, 2000.
. Social comparison, self-regulation, and motivation, 1996.
. Social comparison and the development of achievement motivation. achievement-related motives in children, 1969:46–101.
. Guided social comparisons differentiate motivation to improve health behaviors. Annals of Behavioral Medicine 2014;47:s134.
. Social psychology and economics: Psychology Press, 2013.
. Can affectively negative experiences contribute to well-being? The Affectively Negative Need-Fulfillment Model: The Happy Mind: Cognitive Contributions to Well-Being, Springer 2017:389–407.
. Contributions of social comparison to physical illness and well-being. Social psychological foundations of health and illness 2003:226–55. Contributors WM, KAW, and TAE conceived of the study. WM, KAW, DGS, GBH, and TAE designed the study. WM and RJT recruited patients. WM and RJT collected the data. WM, DGS, KRB, and RJT analyzed the data. All authors interpreted the data. WM drafted the manuscript. All authors contributed substantially to its revision. WM takes responsibility for the paper as a whole. Funding This work was supported by NIDDK/NIH K23DK106511 and 2P30DK092986-07 and NCATS/NIH UL1 TR000445. Ethics approval The Vanderbilt University Institutional Review Board approved this research.